I've been a big fan of Liz Curtis Higg's humorous inspirational books for women and have thoroughly enjoyed the several times I have been privileged to hear her speak at conferences. It was a pleasant surprise to find that she has also written children's books. This past weekend our church held a Fall Festival for the kids of our church and neighborhood. Part of the activities offered was a story time and I was asked to be the reader. The book I was given was The Pumpkin Patch Parable and the familiar name of the author caught my eye. To my delight the story was wonderful. It tells of a very patient farmer who plants seeds in June and waits for them to grow. Every pumpkin is different in size and shape and some even have lumps but they are still all pumpkins. Then the farmer begins to clean one of the pumpkins, being ever so careful with it because while tough on the outside, pumpkins can easily break if dropped. As the analogy--you did catch it, right?--goes on, the farmer cleans out all the slimy parts inside making it nice and clean. He gives the pumpkin a new face, one with a smile. Then he puts a candle in it and "holds it to the flame" a moment. The result is that the pumpkin glows from within and becomes a light in the darkness. All along, there are scripture verses that compliment the story, a convenient teaching tool. Wow, I thought. This is great for the kids, but what a message for adults as well! I borrowed the book and read it to the senior adult class I was teaching in Sunday school next morning. As I predicted, they took home a message as well. Jesus can make us clean, can give us new life, can cause us to be a light in the darkness. 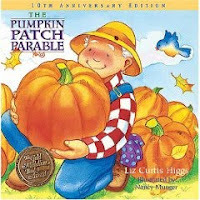 There are other parable books by Higgs and this is one grandmother who is going to look for them in the bookstore.